Foster leadership development and empower teams by understanding your own leadership style, engendering trust, supporting others, and implementing transparent communication. Improve student achievement and develop collaborative teams using various strategies. What kind of leader am I? How do I best tap into others’ skills? How do I build collaborative leadership teams? New and veteran leaders alike ask themselves these questions. Stronger Together will help you face your current reality and determine action steps for improvement. 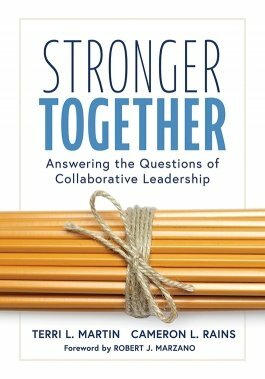 You will discover how to engender trust and empower teams, creating a culture of collaboration and, ultimately, improving student achievement. Understand your own leadership style so you can play to your strengths and improve weaknesses. Learn how to build the right kinds of collaborative teams and create common goals. Use collaborative strategies to create a common vision statement and garner buy-in from team members using the elements of trust: integrity, empathy, and humility. Develop ongoing transparent communication among school leadership, team members, faculty, parents, and students.